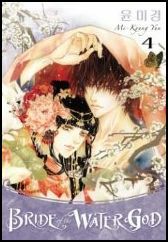 Bride of the Water God is a must-own, simply because of it’s elaborate artwork. The fact that it also has an excellent story, is a plus. The premise of the story is: A village in draught conditions decides to offer up one of it’s girls as a bride to appease the water god so that he will allow it to rain. Soah, the bride girl is then sent out into the ocean in a boat. She seems to crash and drown, ending up in the land of Suguk, a magical place where the gods live. Suguk has a large fish-shaped metal airship that floats above, maneuvering through the sky where rocks with waterfalls are suspended. When Soah meets the water god, Habaek, she finds he is just a boy. There are interesting characters living in the world of Suguk such as the fire god, a witch with a cool tattoo over her eye, and a doctor who seems to want to steal Soah away. As the story progresses, we find that the water god can change into a gorgeous man at night. We also meet his mother, who everyone is scared of because she is the goddess of punishment, torture, and disease. The scariest part of this book is when Soah goes into the forest and sees a dog. She reaches out to him because, like her, he is also a creature out of place in the magical world. Unfortunately, when she reaches out to him he turns into a monster with horrible teeth like an alligator. The gods call him Che, the tiger, ox-tailed monster who barks like a dog and eats humans. 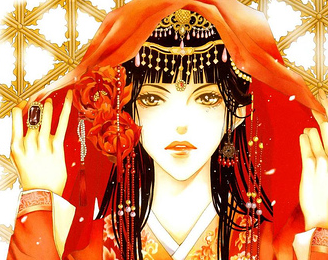 I could go on all day about how much I love this manhwa. I could tell you about the masked messenger Banwang who poses as a dog with wings. I could awe you with descriptions of elaborate formal dress costumes and fanciful architecture, but it’s better you see for yourself by purchasing or previewing these books at Amazon.com. Manhwa’s are Korean-based, not Japanese. In the United States they are generally published in the bigger quality paperback size. Manhwa’s are read in the same direction as US text (not backwards like Japanese mangas). 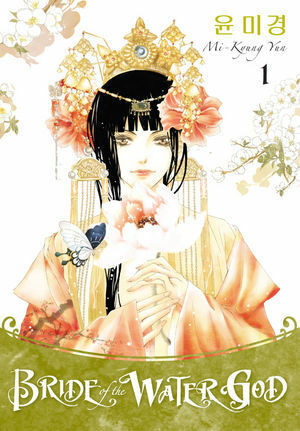 The art in most of the manhwa’s I’ve seen is traditional with beautifully elaborate drawings- the kind you would see on a fan or in one of my favorite books as a child, Tikki Tikki Tembo. By the way, although I know there is criticism about Tikki because of its over exaggeration of Chinese names, it is still close to my heart because it is the first time that I, as a little white girl living in a predominately white community, got to see another culture close up. Most of these manhwa feature a few pages in the front or back that are glossy color photos you just want to rip out and hang on your wall. Older PostHow effective would an active be as a vampire hunter?